This video shows the nail-biting moment when a 100-ft high crane crashed to the ground in a Belfast shipyard. Workers at Harland & Wolff in Belfast looked on in horror as the crane fell, in a potentially lethal accident. No-one was injured. But one person recorded the moment when the 300-ft high Sampson crane moves down the building dock, as sirens blare. The giant crane, which can lift up to 800 tonnes, appears to bang into the small crane, smashing it to the ground. 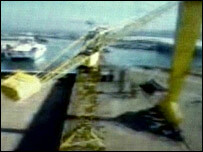 Footage of the 4 April incident at the yard was later posted on the internet. A spokesman for Harland & Wolff confirmed that they believed the film was genuine. "It relates to an incident which occurred at the shipyard on Wednesday 4 April," he said. "But we can make no further comment as the incident is currently the subject of an investigation. We are relieved that no injuries were caused." Harland & Wolff restructured five years ago and employs up to 500 people. The firm is now engaged in modern ship building which means section building, ship repair, marine design engineering and assembly of renewable energy hardware such as offshore wind turbines, wave generators and marine current turbines.